Villa de deux chambres avec vue sur les champs de pâturage, les montagnes et le volcan Platanar. Chambre des maîtres avec 1 lit king size, salle de bain privée, terrasse privée avec des chaises berçantes et des hamacs. La salle de bain principale dispose d'une baignoire avec vue sur les pâturages, les montagnes et le volcan Platanar. La deuxième chambre a 1 lit queen size et possibilité d'ajouter un lit simple ou un lit superposé (seulement pour deux enfants de moins de 12 ans). Salle de bain privée et terrasse privée avec chaises berçantes et hamacs. Cuisine en plein air avec réfrigérateur, cuisinière, micro-ondes, cafetière, tous les plats et ustensiles de cuisine. Le coin repas et le mobilier de détente se trouvent sur le pont. My family and I are leaving this piece of heaven today and are sure to return! The accommodations are beautiful and peaceful, we can hear all the sounds of Costa Rica from our casa. Upon arrival we were greeted like family. We arrived a bit early and Dennis made us delicious cold fruit smoothies while our casa was being prepared. The pool and hot tub were pleasant and breakfast in the morning so delicious. Such a lovely, lush place to sip coffee and have breakfast. The private tours offered here are amazing. The family and I had the pleasure to take a private ATV tour to the hot springs with Grievin who was so attentive and made sure the experience left us with memories to last a lifetime. He pointed out sloth along the way, taking time for us to get amazing photos and video. We hate to leave but are glad to to have the opportunity to experience paradise. An absolute perfect getaway with my daughter. Two bedrooms with full baths provided some personal space. Open kitchen, dining and sitting area with views over a horse pasture and distant volcano view. Kitchen was well stocked for all cooking needs, and items were very clean. Property had hiking paths and offered tours from their property. Staff went out of their way to help with bags and provided information for tours. We hated to leave such a serene environment. We stayed at four different properties across northern Costa Rica and this is one we will return to. Beautiful property, excellent service, & great location! The villa is beautifully designed overlooking the horse pastures and providing a great view of the landscape of the region. The rooms were spacious with large private bathrooms. The living area was open-air which really made you feel like you were in the countryside (no doubt the hammocks and rocking chairs helped). Esteban was a wonderful host. He kept in contact throughout the trip, from our initial inquiry until after checkout. He assisted us in planning and booking a lot of our activities in the area, including zip-lining and white water rafting, so definitely talk to him if you are looking for things to do. They do a great ATV ride from the ranch to a nearby hot spring that is definitely worth checking out! He also has great recommendations for food in the area if you are not looking to cook during your trip. They provide daily cleaning, have a pool, and breakfast is available on-site. You get the feel of a private rental with all of the amenities of a hotel. 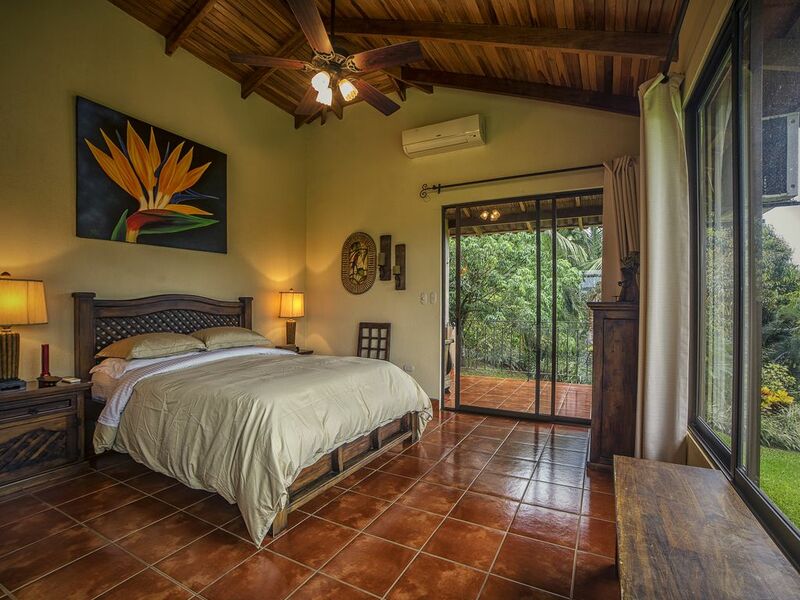 I highly recommend checking out Villa Heliconia at La Finca during your next trip to Costa Rica. I found the place to be more beautiful than expected. The house and grounds are kept impeccably well, the staff are very friendly and Esteban provided a huge amount of useful information for our stay there as well as for the rest of our trip. Magical stay that exceeded our expectations! We arrived based on a friends reccomendation and couldn't have been more pleased. We are a family of four with two teenagers. We are an active family and enjoyed relaxing in our well appointed Casita as well getting out and experiencing incredible excursions. The Casita was comfortable, private and equipped with all modern conveniences. The surroundings are absolutely beautiful. Esteban was extremely helpful and coordinted our activities. He took the time to understand our family's preferences. He does not steer you wrong. We couldn't have been more pleased with the amazing activities that felt one of a kind and not overridden with tourists. We especially enjoyed the river rafting, horseback riding and ATV ride to the magical hot springs. We highly reccomend these outings but would defer to Estaban's suggestions for your family. You will experience a very special Costa Rica. Thank you Esteban and team! Wonderful Family Experience! Pura Vida! Where do we begin? We went down for Spring Break with our 3 kids(11,9 & 5) and we had a blast. We stayed in Villa Heliconia and we loved the setup with the kitchen and living area being out in the open and the two bedrooms on each opposite side. The balcony provided a great view of the mountains in the background with the horses grazing in the pasture. The AC worked really well, since it was really nice and warm down there. There was so much to do on the property for the kids starting with the pool and moving on to some hiking that we did on the property. The kids also enjoyed seeing the stables where the horses were kept and even helped in feeding the horses. Esteban and his staff were wonderful and very attentive to all of our needs! Esteban even helped us out with the car rental, which we greatly appreciated. Driving from San Jose was an adventure in itself, but we finally made it to our destination and were very impressed by our villa. We ended up doing the ATV tour and horseback riding tours, which we highly recommend. The great thing about these tours is that it ends up being a private family tour. We hate going on group tours with a bunch of people that we do not know. The tours were at our own pace and the ATV tour ends with us reaching the hot springs and relaxing in them for about and hour. Our tour guide Alonzo was very good with the kids and provided us with some very fun tours. We drove thru the pineapple plantations and got to see how they are cultivated. The horseback riding was a wonderful experience for our kids that had never been on horses before. The horses were really good with the kids and my 5 year old even had his own horse! We even got to eat some fresh fruit straight off the trees! We ended up leaving from here to Jaco so I'm really glad that we did the horseback and ATV tours here where we really got to enjoy ourselves as a family. The location was great and we got to also see how the sugar cane is cut and carried away when we went on the ATV tour. We were able to cook breakfast there at the villa and there are plenty of local stores nearby that have everything that you would need to cook yourself some meals. Copy and paste link. Pura Vida!